In the first few days of this brave new world without Ben Bernanke at the helm of our country’s dollar printing press (known more popularly as the Federal Reserve), we thought it apropos to review the past eight years of monetary policy and guess what his legacy might be. He rode into office on the enthusiastic waves of the burgeoning housing bubble. At the time, people like Peter Schiff were being ridiculed on business shows for suggesting that the housing market trajectory was unsustainable and that the market had to collapse before too long. It is still a little hard to believe the business world was so incredulous to such a possibility, considering we were still largely in the wake of the dotcom bust. Yes, markets collapse when the fundamentals get out of whack – hadn’t you all noticed??! Gold was trading at an already startling $480 an ounce right before Bernanke was sworn in – way above the 10-year average – and he had it up above $600 an ounce in his first month. Of course, he hadn’t had much of a chance to take a stab at the dollar yet; the market just had an inkling of what was to come. What followed over the next eight years was monetary distortion and abuse of absolute historic proportions. The bond buying program known as Quantitative Easing was the closest thing to outright money printing the Federal Reserve has ever attempted. Under Bernanke, QE expanded the Fed’s balance sheet from around $800 billion to an unbelievable $4 trillion. And not that he noticed what happened to gold during his tenure (after all, he’s a notorious gold hater and even absurdly blaming the Great Depression on the gold standard) but the yellow metal nearly tripled in price. To digress, you might think a precious metals dealer might cheer the “bullish” move for gold that Bernanke enabled, but quite the contrary, because it says more about the sinking value of the dollar than it does about the value of gold. No one wants to see the financial chaos brought about by a cheapening and collapsing dollar. Nonetheless, that is what we are facing, thanks to Bernanke’s crazy monetary policies, and it is for this reason that our clients come to us to help protect their savings. The Fed has a dual mandate to keep employment up and prices stable. When Bernanke took the helm at the Fed, official unemployment was 4.7%. Now we are thrilled and relieved that it is only 6.7%. The Consumer Price Index increase in January 2006 was 0.8%. In December 2013 it was 0.3%… but that’s only if you believe the official numbers, which have been massaged into goo. Alternate data shows CPI inflation could more accurately be approaching 10%. We ask you: Which inflation number makes more sense in your neck of the woods? Alternate stats similarly have unemployment well above 20%, climbing sharply in the early Bernanke years. In his final months, he started the process of tiptoeing the Fed out of the corner he had painted it into by announcing the taper. It is now up to Janet Yellen to continue tapering in the hopes that the dollar can be saved from a brutal $4 trillion assault. That remains to be seen. She herself was a major architect and cheerleader of Quantitative Easing. Now she has the chance to oversee it. Will she continue it? As far as Bernanke’s legacy is concerned, $4 trillion is a lot of money, even by today’s standards. As all that liquidity unwinds, if the entire economy is encompassed in an enormous bubble that could pop under Yellen, we’re guessing that Bernanke will be remembered as the guy who blew it. 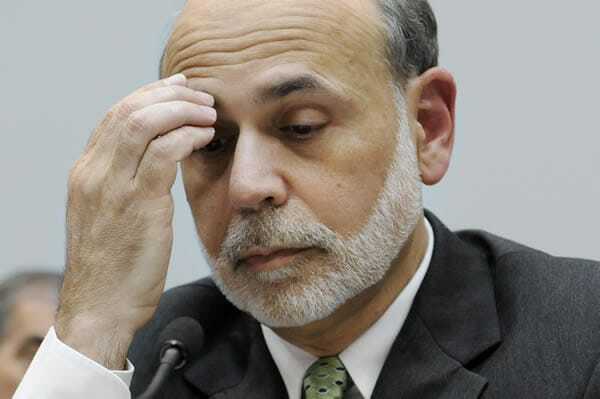 Meanwhile, Bernanke has wasted no time between jobs. After leaving the Fed on Friday, he showed up at the Brookings Institution this Monday where he will have a nice quiet office in which to write a riveting book on the horrors of deflation or something. We would breathe a sigh of relief except that the choice of Janet Yellen for Fed Chair only promises more of the same. And you know what that means. Three words: Buy gold now.